What is it? A text-heavy turn-based cRPG. My charismatic elven Street Samurai could talk my way through a locked door, but couldn’t hit a troll at two paces. And yet here I was, staring down an angry vampire upset at my late-night stock-check of her boyfriend’s flat. This rooftop duel under neon floodlights convinced me that Shadowrun had at last unlocked the potential in its magic-meets-cyberpunk setting. If I lost, I’d enjoy life as a servile pawn; if I won, she might convince her other half to dispose of a valued asset. It’s all tension, melodrama and, as it turns out, complete farce. Almost as soon as the lead starts flying, she calls a halt and agrees to deal—because she’s not an age-old force of destruction; she’s an accountant. A vampire accountant. Who says corporate jobs are dull? This world of magic and megacorps in near-future Earth ought to be exciting, but the business of shadowrunning (dirty, untraceable work for the highest bidder) was a touch dry in Shadowrun Returns and its expandalone, Dragonfall. Hong Kong is blessed by the camp excess of Eastern cinema. You find it in the lurid neon that adorns every shopfront, the clichéd retorts, the triad wars and the B-movie heists that Shadowrun Hong Kong delights in. It’s like the series has relaxed, comfortable in its own skin, convinced by a third successful Kickstarter that it’s good at what it does. 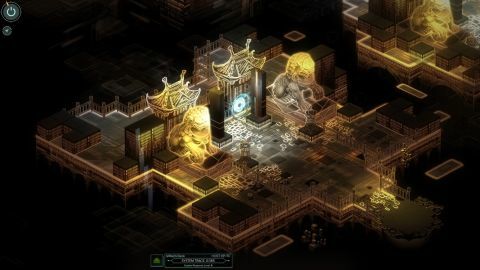 Shadowrun is about intrigue above all, and the new story raises questions aplenty. As a clean-nosed tourist in search of your estranged foster father, it’s all of five minutes before you’re forced into roving firefights with the Hong Kong police. You descend into a life of crime, branded a terrorist and desperate for triad protection, taking on a multitude of unsavoury shadowruns while your new boss (the improperly named Kindly Cheng) tracks down your dad and puzzles out his link to the poverty-strangled Walled City. Hong Kong is a more personal and urgent adventure than Shadowrun Returns—you’re not so much a hero as a well-armed victim—and it surpasses Dragonfall in dark comic grandeur. There’s the staple murder mystery, Hollywood backstabbing, impromptu feng shui and some casual tomb raiding to keep things fresh. Scene-setting is handled by text and décor alone as you fight through missions in reliable turn-based combat, which is all but unchanged from the previous games. Given the fans’ appetite for Shadowrun, it makes sense to return with more of the adventures we've already enjoyed, but Hong Kong feels safe. In the face of competitors like Pillars of Eternity with its character-packed voice work, Shadowrun needs to adapt or become dated. Static though the settings are, they’re lavish to an obscene degree. It’s luxurious, hands-off spectacle that exists to support the writing, and occasionally outshines it. It’s a shame that $1.2m wasn’t enough to resolve the longstanding interface woes. The UI is cleaner, certainly, but a certain amount of patience is required to see past input lag and, on one occasion, complete failure of input recognition that caused my runner to stroll about in sleeping gas instead of taking the lift. I left her behind with vindictive pleasure. And for all the quality of Hong Kong’s dialogue, it’s still prone to offer an illusion of player choice over meaningful roleplay. Polite, smartass and slow-witted options typically mask the same response, only prefixed with a different description of a facial expression. Regardless, Shadowrun Hong Kong is a spectacular story of deceit and poisonous evil that will lure you through the most indulgent settings yet seen in the cRPG renaissance. For the price, the scale is giddying, but Shadowrun is starting to cry out for innovation—these are new (quite excellent) assets and a fresh script retrofitted to a two-year-old game. Harebrained works tirelessly to please its backers, but if Shadowrun continues to tread water, the genre it brought out of obscurity could end up slipping back into the shadows.